Here is something I learnt the hard way today … If you use Live Writer to blog to WordPress, you will benefit from what I learnt. I use Live Writer for blogging to WordPress. I love it – brilliant tool. I have posted 120+ blogs so far. This one had many images. When I posted the draft I got this error. 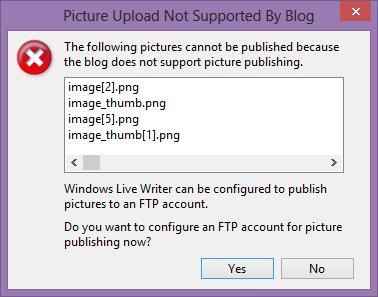 Web search on “Picture Upload Not Supported By Blog in Live Writer” revealed many potential solutions but most of these were about specifying proper access control on the upload folders in self-hosted WordPress platform. It did not apply to me. Then I realized that there was a file inserted in the post using the Insert Object plugin (Live Writer plugin). But that was also normal – I have inserted many files before without any problem. But I posted it somehow by manually adding these two images. Problem still not solved. Then my good friend, Kamal Karnatak, Group CIO of RJ Group, a large soft drink bottling company, posted a comment on the blog saying that the file in my post is not available for download. While Live Writer was trying to post the draft to WordPress, it encountered the file upload error but I guess it did not know how to handle it. Most probably because the error message passed to it by the Insert Object plugin was ambiguous or wrong. So it ended up showing the image related error. Finally, I uploaded the file to SkyDrive (oh, sorry… OneDrive) and linked it. Everything worked fine. All is well!